I was really craving wearing a baby pink. After wearing Essie’s “Borrowed and Blue” I was really feeling those baby shower type colors. So I was going to reach for one of my go-to baby pink shades when I remembered Julep “Penelope.” I did not have the nicest things to say about this polish when I got this in one of my Maven boxes. I remembered seeing another girl feature this polish on her blog and her post said that while it was sheer it covered nicely in 3 coats. So I contemplated that maybe I judged this polish too harshly. So I pulled it out to give it another shot and really wish I had followed my intuition. Penelope turned out to be a 4 coat polish and I ended up using up a quarter of the bottle on one manicure, and that is on top of the small portion I used first swatching this. I figured I put in the effort to make this polish work, I might as well keep it on but when I put on a coat of Seche Vete, the classic Seche problem occurred. Seche has a tendency to cause tip shrinkage (and I literally giggled out loud when I wrote that, get the pun? yes I have a trashy mind). So on half my nails, the 4 coats pulled back and I had weird lines at the tips of all my nails. So instead of just taking off my manicure that I spent way too long on. I decided to pull out a less loved polish. 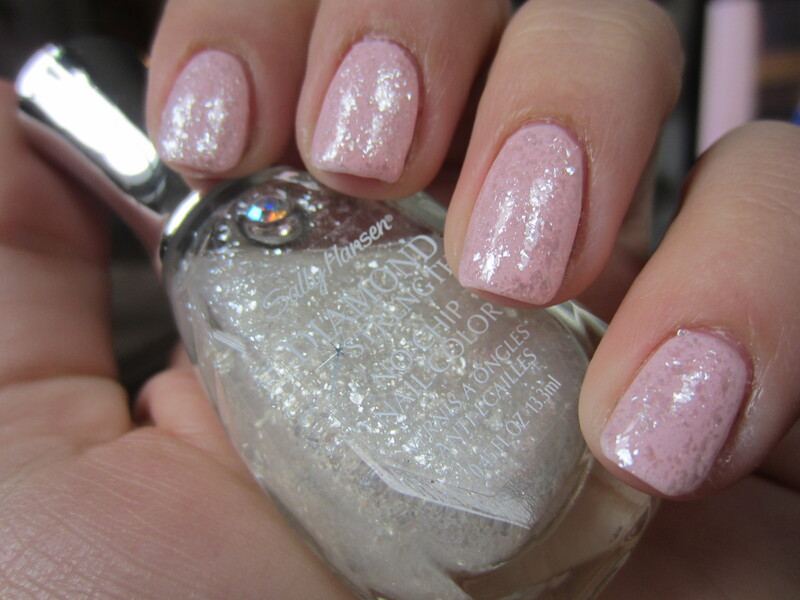 Sally Hansen “Glass Slipper” is another flakie polish but instead of an opalescent type flakie, its just silver. Think Essie “Pure Pearlfection” except true flakes rather than a pearl type top coat. I first saw this polish on tumblr and freaked out. I needed to have it in my life immediately and I hunted this down in so many drug stores. I ended up finding it after about 2 weeks of stopping in every single drug store I drove past. I fell in love with this polish and wore it for about 2 weeks straight, and naturally that was when I was in Ireland over Christmas and New Years so I wasn’t putting up any blog posts. Then this polish was retired onto my shelf and I can’t believe it took me this long to pull it back out. I’ve worn this over mostly darker colors and it is stunning (especially over dark blue) but this is the first time that I have worn it over a light color but I think its just as stunning. For a polish this pretty that you can find at drug stores that is roughly $2 and still available, its a steal! Dry time is good, the formula is similar to other flakies but unfortunately so is removal. But I can’t believe I haven’t played with this polish more and you might be seeing more swatches of this in the future! What do you guys think? Have you ever seen Glass Slipper? Do any of you own it? you had be laughing so hard on the tip wear joke LOL!!! And seriously it`s $2 in the US – really good deal!!! lol thanks but thats what i think about whenever people talk about the seche problem. dirty mind i guess. I love that glass slipper polish…I purchased it immediately when I saw it! This mani is so soft and pretty, very feminine!